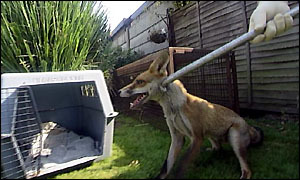 BBC News has two stories about the growing fox problem in the U.K.
From 2001, Urban fox hunt [warning: photos may be disturbing] describes how “foxes — once mostly confined to the countryside — are becoming almost as common in cities as stray cats.” Their increasing numbers are causing clashes between those who believe they’re harmless and those who believe they’re a nuisance. About one in seven foxes are now townies. Most live in leafy outer suburbs, but more and more are heading for city centres with sightings at places like Buckingham Palace Gardens and the House of Lords. Many homeowners are welcoming the new arrivals by leaving out food and milk on their back lawns. But others complain that foxes are digging up their gardens, fouling their lawns, attacking their pets and ripping open their garbage bags. All of this is proving a big boom for pest control firms like the one run by Bruce Lyndsay-Smith, who says foxes are now bigger business than rodents. Apparently the problem has not abated in the past five years. A second article describes how one couple spent hundreds on fox bane. They’ve tried chicken wire and ultra-sonic devices, but nothing has worked.